Dr. James Stobbe is an Okotoks Family Dentist who is originally from a small town in southwestern Manitoba. While he still loves Manitoba, he really fell in love with Southern Alberta when he worked summer jobs here during his teenage years. Originally, Dr. Stobbe completed his post-secondary education in California and was considering a career in Marine Biology; but life intervened. While working as a painter at the home of a dentist, he spent time sitting and chatting with the dentist after hours and became inspired to change his own course to enter the field of dentistry. 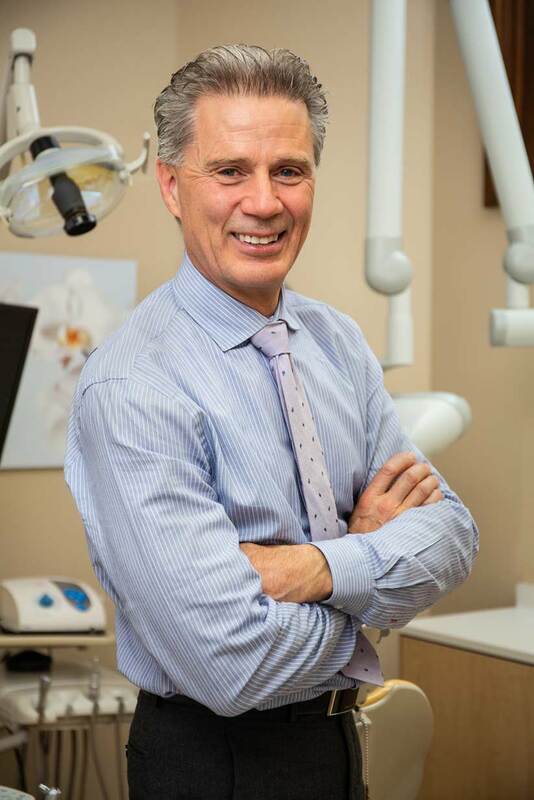 Returning to Canada, Dr. Stobbe went on to get his Doctorate in Dentistry from the University of Manitoba in 1985. Dr. Stobbe then began his dental career in Calgary in 1985 and spent the next 5 years in the city, but he soon felt the call of the rural lifestyle. He sold his Calgary practice to pursue a more laid-back lifestyle. Now blending a successful professional career along with a thriving personal life. The experience that Dr. Stobbe has gained after almost 30 years in dentistry has not been limited to just increasing his understanding of dental techniques. He has developed a keen sense of awareness when it comes to understanding the many fears that potential patients have of dentistry and going to see a dentist. By re-focusing this sensitivity, Dr. Stobbe continually seeks to provide a calming level to his clientele, along with a true sense of professionalism and trustworthiness. As such, he is a strong advocate of patient education, which allows clients to build trust with him and then choose their own ‘best treatment’. Finding dentistry an incredibly satisfying profession, Dr. Stobbe still enjoys seeing the excited faces on his patients when they first see their ‘new smiles’ and the feelings of self-confidence that evokes in them. He also greatly enjoys the constant evolution within the dental profession as technology opens new and exciting doors within the realms of treatment. His is a firm believer in constant education and training updates for both himself and his staff. Dr. Stobbe’s first passion in his life is his family. He is married to his lovely wife, Laura, and they have two beautiful daughters. As his personal interests, Dr. Stobbe enjoys soccer, hockey, kayaking, scuba diving, and baseball. Besides being passionate about dentistry and his practice, he still finds time to give back to the community. Dr. Stobbe has traveled to Guatemala several years in a row to volunteer for a variety of worthwhile projects. He has helped build houses, clinics as well as a volunteer dental clinic. He has also supported World Vision for many years, particularly for their fiscally responsible priorities that support children and families in developing countries. Finally, Dr. Stobbe would like to work towards inspiring others – like he was inspired – to enter the Dental Profession. Dr. Stobbe feels especially privileged to have the trust of his patients over so many years …. and looks forward to enjoying that privilege for many years to come!